The 10th anniversary of the Corporate Elite show is happening this weekend and Pepsi throwing in their weight as the head sponsor of the always interesting show will make it even more better this year. 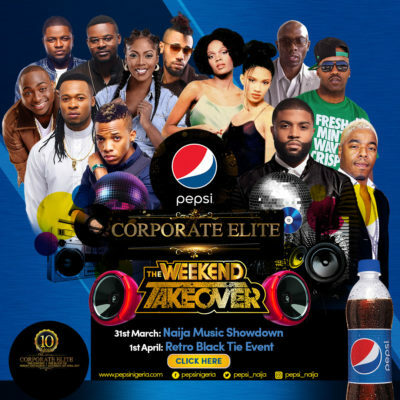 The Pepsi Corporate Elite is scheduled to take place over the weekend of the 31st of March and the 1st of April and yes, we have some free tickets to give away!!! The show which will feature a Naija Music Showdown, will take place on Friday the 31st of March and will see performances from some of Nigeria’s hottest acts to include Tekno, Flavour, Davido, Tiwa Savage, Phyno, Falz, Skales. The fun continues with a follow up show on 1st of April at the Retro Black Tie event where international artistes like Sisqo, Blackstreet, Next and Jagged Edge will perform. Excited yet? So You want tickets right? Aii then…get these questions right and win a ticket for yourself. List the Nigerian artistes endorsed by Pepsi.